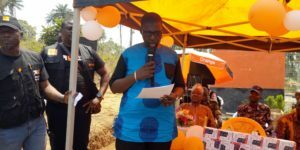 Orange Telecom Sierra Leone, one of the leading GSM providers in the country, last week Thursday, March 7th launched their pole site at Bomaru Village, Kailanhun Distrct. Speaking at the launching ceremony, Orange Telecom Marketing Director, Lurent Kiba, said the launch of the pole site was a continuation of a journey they had started in June, 2016- to invest with more than 33 million United States Dollars and improve and expand their network in the country. He said they had launched the modernization plan to completely change the network and make it much more reliable, with better quality for voice and data services, adding that they had also launched an expansion plan to improve the coverage. He said they have made tremendous progress in 2018 especially in the area of modernization of the access network by changing all equipment on all their towers across the country, and expanded & installed new pole sites and also acquired their 4G license. “Today, we see our ambition is becoming a reality as the Orange family is here in Bomaru to formally launch it newly constructed pole site,” he said. He said the opening of the pole site in relation to rural connectivity goes beyond technical aspect, which remains very important, adding that it has shorten the distance and brought family and friends closer. He said communication was key to national development pyramid and that it has changed people’s lives for the better, thus noting that with the availability of the site in the village, it would promote financial services and can help the people to communicate with the rest of the world. “As a company, we are also putting into practice the real essence of the Orange strategy, listening to the need of our customers and responding with new offers, product and services relevant to you,” he said. He disclosed that they have reached two million customers and their catalogue of products and services are really rich with abundant offers. “In the coming months and years, we will continue to build a network of international standards and expand our services into untapped and underserved areas,” he said. He said the continued investment in the country confirms the company’s commitment to improving the lives of the communities in which they operate, adding that they were also supporting the government with materials worth one million five hundred thousand United States Dollars to the Free Quality education. He further that they were also working with the Ministry of Health and Sanitation in creating breast cancer awareness and offering care treatment, with the support of women in the country to be entrepreneurs by offering the opportunity to do telecom business. Representative of the Paramount Chief – Senese Kutubu, said they were very happy for the lunch of the pole site in their Chiefdom, adding that over the years they would have to travel to mountings to access network. He promised that as Chiefdom authorities, they were going to do all in their powers to protect the pole site facility, adding that with the availability of Orange Telecom network in the chiefdom they can now be in their bedrooms and communicate with the rest of the world. Councilor Nasuru Deen-Cole, said he was very grateful for the development Orange has taken to his Ward, noting that if such facility was in the village in 1991 the devastating war, which started in the Bomaru Village would not have spread and caused more damage the way it happened.